Cells are the basic unit of life. In the modern world, they are the smallest known world that performs all of life’s functions. All living organisms are either single cells, or are multicellular organisms composed of many cells working together. A cell membrane that keeps the chemical reactions of life together. Cytoplasm – the fluid inside the cell, in which the chemical processes of life occur. Below we will discuss the functions that cells must fulfill in order to facilitate life, and how they fulfill these functions. A living thing must respond to changes in its environment. A living thing must grow and develop across its lifespan. A living thing must be able to reproduce, or make copies of itself. A living thing must have metabolism. A living thing must maintain homeostasis, or keep its internal environment the same regardless of outside changes. A living thing must be made of cells. A living thing must pass on traits to its offspring. It is the biology of cells which enables living things to perform all of these functions. Below, we discuss how they make the functions of life possible. A cell membrane that separates the inside of the cell from the outside. By concentrating the chemical reactions of life inside a small area within a membrane, cells allow the reactions of life to proceed much faster than they otherwise would. Genetic material which is capable of passing on traits to the cell’s offspring. In order to reproduce, organisms must ensure that their offspring have all the information that they need to be able to carry out all the functions of life.All modern cells accomplish this using DNA, whose base-pairing properties allow cells to make accurate copies of a cell’s “blueprints” and “operating system.” Some scientists think that the first cells might have used RNA instead. Proteins that perform a wide variety of structural, metabolic, and reproductive functions. There are countless different functions that cells must perform to obtain energy and reproduce. Depending on the cell, examples of these functions can include photosynthesis, breaking down sugar, locomotion, copying its own DNA, allowing certain substances to pass through the cell membrane while keeping others out, etc. Proteins are made of amino acids, which are like the “Legos” of biochemistry. Amino acids come in different sizes, different shapes, and with different properties such as polarity, ionic charge, and hydrophobicity. By putting amino acids together based on the instructions in their genetic material, cells can create biochemical machinery to perform almost any function. Some scientists think that the first cells might have used RNA to accomplish some vital functions, and then moved to much more versatile amino acids to do the job as the result of a mutation. The different cell types we will discuss below have different ways of accomplishing these functions. Because of the millions of diverse species of life on Earth, which grow and change gradually over time, there are countless differences between the countless extant types of cells. However, here we will look at the two major types of cells, and two important sub-categories of each. Prokaryotes are the simpler and older of the two major types of cells. Prokaryotes are single-celled organisms. Bacteria and archaebacteria are examples of prokaryotic cells. Prokaryotic cells have a cell membrane, and one or more layers of additional protection from the outside environment. Many prokaryotes have a cell membrane made of phospholipids, enclosed by a cell wall made of a rigid sugar. The cell wall may be enclosed by another thick “capsule” made of sugars. Many prokaryotic cells also have cilia, tails, or other ways in which the cell can control its movement. These characteristics, as well as the cell wall and capsule, reflect the fact that prokaryotic cells are going it alone in the environment. They are not part of a multicellular organism, which might have whole layers of cells devoted to protecting other cells from the environment, or to creating motion. Prokaryotic cells have a single chromosome which contains all of the cell’s essential hereditary material and operating instructions. This single chromosome is usually round. There is no nucleus, or any other internal membranes or organelles. The chromosome just floats in the cell’s cytoplasm. Additional genetic traits and information might be contained in other gene units within the cytoplasm, called “plasmids,” but these are usually genes that are passed back and forth by prokaryotes though the process of “horizontal gene transfer,” which is when one cell gives genetic material to another. Plasmids contain non-essential DNA that the cell can live without, and which is not necessarily passed on to offspring. When a prokaryotic cell is ready to reproduce, it makes a copy of its single chromosome. Then the cell splits in half, apportioning one copy of its chromosome and a random assortment of plasmids to each daughter cell. There are two major types of prokaryotes known to scientists to date: archaebacteria, which are a very old lineage of life with some biochemical differences from bacteria and eukaryotes, and bacteria, sometimes called “eubacteria,” or “true bacteria” to differentiate them from archaebacteria. Bacteria are thought to be more “modern” descendants of archaebacteria. Both families have “bacteria” in the name because the differences between them were not understood prior to the invention of modern biochemical and genetic analysis techniques. When scientists began to examine the biochemistry and genetics of prokaryotes in detail, they discovered these two very different groups, who probably have different relationships to eukaryotes and different evolutionary histories! Some scientists think that eukaryotes like humans are more closely related to bacteria, since eukaryotes have similar cell membrane chemistry to bacteria. Others think that archaebacteria are more closely related to us eukaryotes, since they use similar proteins to reproduce their chromosomes. Still others think that we might be descended from both – that eukaryotic cells might have come into existence when archaebacteria started living inside of a bacterial cell, or vice versa! This would explain how we have important genetic and chemical attributes of both, and why we have multiple internal compartments such as the nucleus, chloroplasts, and mitochondria! Eukaryotic cells are thought to be the most modern major cell type. All multicellular organisms, including you, your cat, and your houseplants, are eukaryotes. Eukaryotic cells seem to have “learned” to work together to create multicellular organisms, while prokaryotes seem unable to do this. Eukaryotic cells usually have more than one chromosome, which contains large amounts of genetic information. Within the body of a multicellular organism, different genes within these chromosomes may be switched “on” and “off,” allowing for cells that have different traits and perform different functions within the same organism. Eukaryotic cells also have one or more internal membranes, which has led scientists to the conclusion that eukaryotic cells likely evolved when one or more types of prokaryote began living in symbiotic relationships inside of other cells. For animal cells – Mitochondria, which liberate the energy from sugar and turn it into ATP in an extremely efficient way. Mitochondria even have their own DNA, separate from the cells’ nuclear DNA, which gives further support for the theory that they used to be independent bacteria. For plant cells – Chloroplasts, which perform photosynthesis, making ATP and sugar from sunlight and air. Chloroplasts also have their own DNA, suggesting that they may have originated as photosynthetic bacteria. Nucleus – In eukaryotic cells, the nucleus contains the essential DNA blueprints and operating instructions for the cell. The nuclear envelope is thought to provide an extra layer of protection for the DNA against toxins or invaders which might damage it. It is unknown whether the nucleus might also have been an endosymbiotic prokaryote at one time, or whether its membrane simply evolved as an extra layer of protection for the cell’s DNA. Endoplasmic reticulum – This complex internal membrane is a major site of protein creation for cells. The evolutionary origin of the endoplasmic reticulum is not known. Golgi apparatus – This internal membrane complex can be thought of like the endoplasmic reticulum’s “post office.” It receives proteins from the ER, packages and “labels” them by attaching sugars as needed, and then ships them off to their final destinations! Others – Many eukaryotic cells can create temporary internal membrane “sacs,” called “vacuoles,” to store waste, or to package important materials. Some cells, for example have special vacuoles called “lysosomes” which are full of corrosive substances and digestive enzymes. Cells simply dump their “trash” into lysosomes, where the harsh environment breaks them down into simpler components that can be re-used! As mentioned above, archaebacteria are a very old form of prokaryotic cells. Biologists actually put them in their own “domain” of life, separate from other bacteria. Their cell membranes, which are made of a type of lipid not found in either bacteria or eukaryotic cell membranes. Their DNA replication enzymes, which are more similar to those of eukaryotes than those of bacteria, suggesting that bacteria and archae are only distantly related, and archaebacteria may actually be more closely related to us than to modern bacteria. Some archaebacteria have the ability to produce methane, which is a metabolic process not found in any bacteria or any eukaryotes. Archaebacteria’s unique chemical attributes allow them to live in extreme environments, such as superheated water, extremely salty water, and some environments which are toxic to all other life forms. Scientists became very excited in recent years at the discovery of Lokiarchaeota – a type of archaebacteria which shares many genes with eukaryotes that had never before been found in prokaryotic cells! It is now thought that Lokiarchaeota may be our closest living relative in the prokaryotic world. You are most likely familiar with the type of bacteria that can make you sick. Indeed, common pathogens like Streptococcus and Staphylococcus are prokaryotic bacterial cells. But there are also many types of helpful bacteria – including those that break down dead waste to turn useless materials into fertile soil, and bacteria that live in our own digestive tract and help us digest food. Bacterial cells can commonly be found living in symbiotic relationships with multicellular organisms like ourselves, in the soil, and anywhere else that’s not too extreme for them to live! Plant cells are eukaryotic cells that are part of multicellular, photosynthetic organisms. Plants cells have chloroplast organelles, which contain pigments that absorb photons of light and harvest the energy of those photons. Chloroplasts have the remarkable ability to turn light energy into cellular fuel, and use this energy to take carbon dioxide from the air and turn it into sugars that can be used by living things as fuel or building material. In addition to having chloroplasts, plant cells also typically have a cell wall made of a rigid sugars, to enable plant tissues to maintain their upright structures such as leaves, stems, and tree trunks. Plant cells also have the usual eukaryotic organelles including a nucleus, endoplasmic reticulum, and Golgi apparatus. For this exercise, let’s look at a type of animal cell that is of great importance to you: your own liver cell. Like all animal cells, it has mitochondria which perform cellular respiration, turning oxygen and sugar into large amounts of ATP to power cellular functions. It also has the same organelles as most animal cells: a nucleus, endoplasmic reticulum, Golgi apparatus, etc.. But as part of a multicellular organism, your liver cell also expresses unique genes, which give it unique traits and abilities. Liver cells in particular contain enzymes that break down many toxins, which is what allows the liver to purify your blood and break down dangerous bodily waste. The liver cell is an excellent example of how multicellular organisms can be more efficient by having different cell types work together. Your body could not survive without liver cells to break down certain toxins and waste products, but the liver cell itself could not survive without nerve and muscle cells that help you find food, and a digestive tract to break down that food into easily digestible sugars. And all of these cell types contain the information to make all the other cell types! It’s simply a matter of which genes are switched “on” or “off” during development. Epigenetics – The process by which genes are turned “on” or “off” by adding or removing chemical groups from parts of the chromosome. Eukaryotes – Complex cells with multiple chromosomes and internal organelles such as mitochondria, chloroplasts, and nuclei. 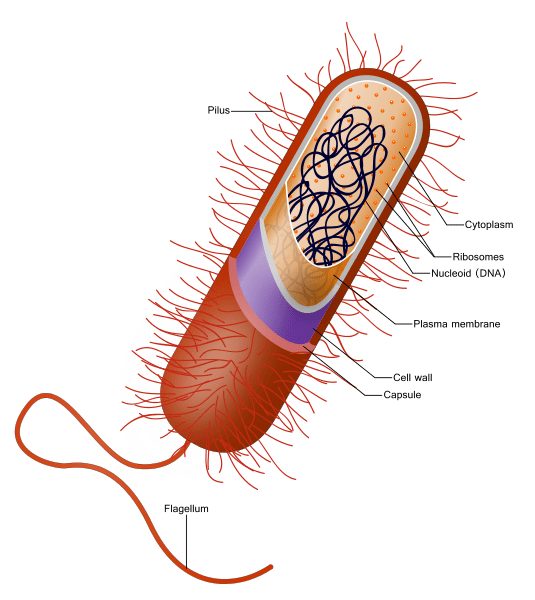 Prokaryote – Single-celled organisms with a simple structure, typically having one chromosome and no internal organelles. 1. Which of the following is NOT an essential function that all living things must perform? A. A living thing must reproduce. B. A living thing must be able to maintain its internal environment, regardless of external changes. C. A living thing must respond to changes in its environment. D is correct. All of the above are essential functions of life! 2. Which of the following is NOT a type of prokaryotic cell? D is correct. Liver cells are eukaryotic cells, like all cells from multicellular organisms! 3. Which of the following is NOT a eukaryotic cell organelle? B is correct. Plasmids are pieces of DNA that are passed between prokaryotic cells. They are not organelles.